Wellington-born anthropologist, Diamond Jenness was a member of the 1913-1918 Canadian Arctic Expedition led by Vilhjalmur Stefansson. 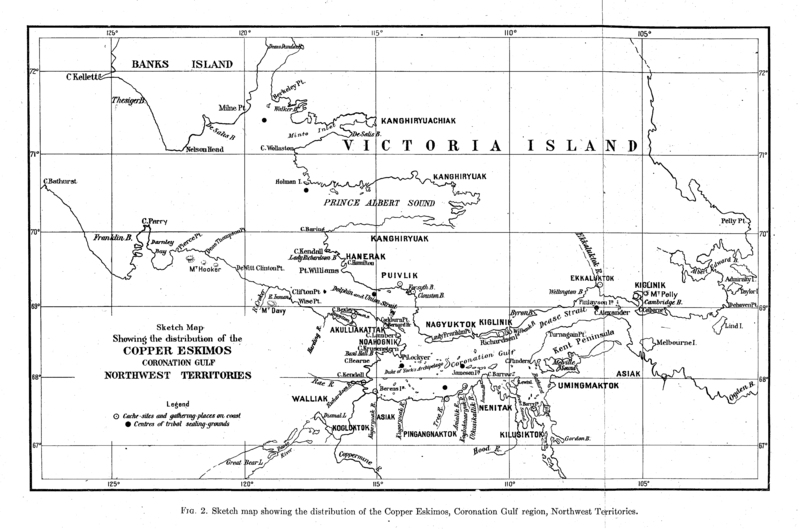 There were two parties – North and South – and Jenness travelled south to study the ‘Copper Eskimos’. Over two years, he lived on and off with the Inuit in and around Victoria Island, the eighth largest island in the world. Jenness studied the Inuit appearance, dress, and customs; he made recordings of their songs, took photographs, and gathered artefacts. Later in his career he became Canada’s Chief Anthropologist and published well over 100 papers on the Inuit and First Nations people of Canada. ___, “Report of the Canadian Arctic Expedition, 1913-18. Vol. XII,” ourheritage.ac.nz | OUR Heritage, accessed April 22, 2019, http://otago.ourheritage.ac.nz/items/show/9642.